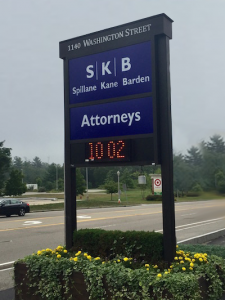 About SKB Law: SKB Attorneys is a full service law firm, concentrating in personal injury, auto accidents, real estate, estate planning, probate and estate administration, divorce and family law, bankruptcy, elder law, business law, social security disability and all forms of civil litigation. We have a diverse staff of attorneys, each with particular areas of concentration, with offices in Hanover and Quincy. Clients have come from all regions of Massachusetts to seek out the superior quality of service delivered by our firm. At our law firm, we strive to continue the tradition of excellence and quality our clients have come to know and expect from us. We combine our extensive legal resources with the personalized service and attention that our clients deserve. In short, we live our lives by the golden rule. We treat everyone the way we want to be treated ourselves – with courtesy, compassion and understanding. Most people understand that good lawyers are busy lawyers, and we are, but we are never too busy to keep in close communication with our clients. They are the reason we are here. We are available 24 hours a day for emergency calls and are very diligent about returning calls as soon as possible. Wherever our clients visit us, we have the staff and resources to provide the best service possible. We use the latest in telecommunications technology and computer networks to help us be more responsive and more efficient. We make sure we explain to each client at the beginning of our representation what they can expect from us and what we expect of them so we have an understanding and good foundation for a positive relationship. Our staff is highly trained and experienced in substantive legal matters and subscribes to the same commitment to client service. They are adept at helping our clients with general concerns and questions. We do everything we can to maximize recovery for our clients. This usually means we will file a claim in court early in the process, and work diligently to build a case for each client. We work with clients closely to develop the appropriate strategy, always with an eye toward getting the best result possible. If that means taking a case to trial, we have experienced litigators ready to do whatever it takes to get our clients the results they expect.